Modern North Pacific intermediate water (NPIW) is formed in the mixed water region where the Oyashio and Kuroshio currents meet. The source for cooling and freshening of NPIW is intermediate water in the Okhotsk Sea. The Okhotsk intermediate water outflows to the open Pacific, forming the Oyashio intermediate water by mixing with the subarctic gyre water. In the Oyashio region, the intermediate water originating from the Okhotsk Sea flows mainly at depths shallower than 500 m. On the other hand, ventilation of intermediate water in the subarctic Pacific during the deglaciation remains a topic of debate. 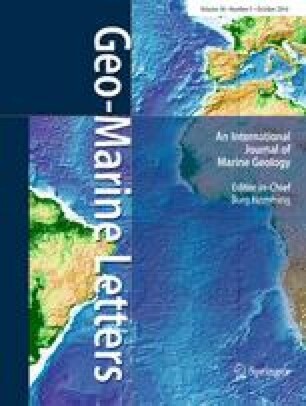 In this study, foraminiferal δ18O and δ13C signatures were determined in a dated sediment core collected at 777 m water depth to evaluate the intensity and depth distribution of the source of NPIW since the last deglaciation in the Oyashio region. Benthic foraminiferal δ18O increased by 0.3–0.4‰ from the end of the Bølling/Ållerød warm episode to the Younger Dryas cold episode, suggesting intermediate water cooling. Consistent with this trend, benthic δ13C values point to decreased nutrient contents during the cold event. Conversely, benthic δ18O signatures from a nearby core site at a water depth of 1,366 m did not show such cooling. These results suggest that cold intermediate water originating from the north was actively ventilated at depths of at least 700–800 m, and possibly even 1,200 m during the Younger Dryas, implying that NPIW ventilation was thicker and deeper than under modern conditions. The online version of this article (doi: 10.1007/s00367-016-0450-x) contains supplementary material, which is available to authorized users. We thank Isao Motoyama, Ken Ikehara, Michiyo Kobayashi, Takashi Setoguchi, Naoto Danzuka, Yutaro Asano, Hiroyuki Yoshii, Yasuyuki Tatsuta, and Katsunori Kimoto for sample preparation and isotope analyses. We also thank the captain, crew, and scientific staff of the MR04-06 cruise aboard the R/V Mirai. This study was supported by JSPS KAKENHI grant number 26400504, under the cooperative research program of the Center for Advanced Marine Core Research (CMCR), Kochi University (07A021, 08A007, 08B006, 09B032, 14A008, 14B006). The manuscript benefitted from independent review comments as well as additional suggestions from the journal editors. The authors declare that there is no conflict of interest with third parties.